Often unknowingly, fly anglers make unique and vital contributions to the economies and conservation efforts of small communities all over the Pacific. Over the past 7 years I’ve had the pleasure and privilege of being involved in the research or establishment of a number recreational fisheries within the realm of the mighty Pacific Ocean. 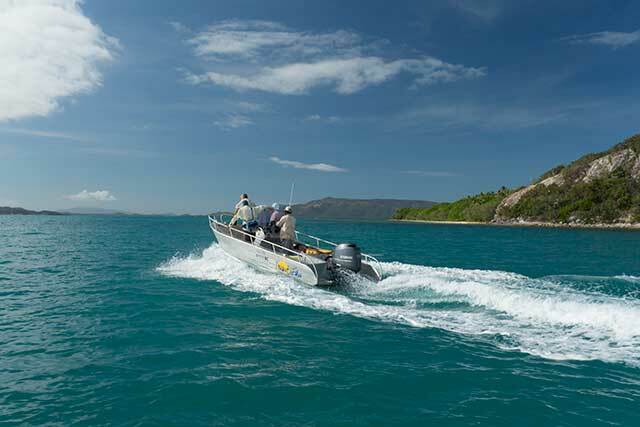 New Caledonia offers bonefishing in some of the most beautiful and remote waters of the South Pacific. Credit: New Caledonia on the globe by TUBS. Wind the clock back to late December 2012, and we’re in the Poingam region at the very northern tip New Caledonia. I’m here at the bequest of Michel Blanc, Fisheries Development Adviser for the Secretariat of the Pacific Community (SPC). We’re here to scope bonefish opportunities and train our local Kanak guide, Benjamin Dahma. 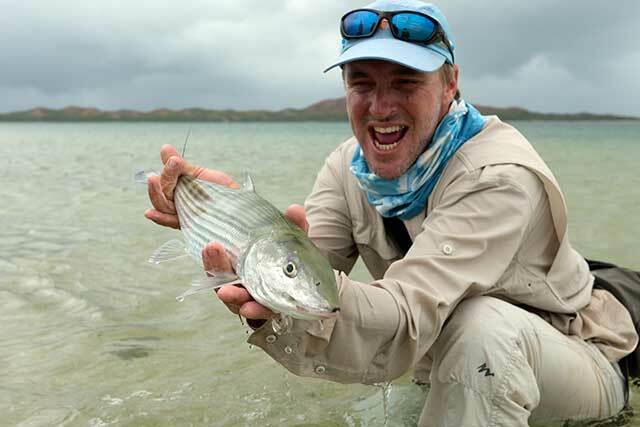 It’s Albula glossodonta that we’ll be chasing, the short-jawed, or round jaw bonefish. Glossodonta is perhaps the most widespread species in the Indo-Pacific, the same species Dr. Aaron Adams of the Bonefish and Tarpon Trust first identified for us on Aitutaki in the Cook Islands. As a highly regarded sportsfish species, fly anglers travel the world for an encounter with this sliver rocket of the flats. We hope they will travel here to Poingam. Over the course of our 10-day trip much time is spent rehearsing with Ben the multitude of things he will use as a commercial bonefish guide. Angler etiquette, basic English skills, hospitality, basic first aid, knot tying, fly casting and fly tying are some of the many topics. The grass in front of our bungalow is littered with coconuts and this area becomes our classroom as we practice “out on the flats” – the coconuts playing the part of the bonefish that our imaginary clients have come to catch. Together we spend many afternoons role playing as Ben practices calling out the location and distance of our coconut bonefish and the direction in which there they are swimming. “Bonefish! – 3 O’clock, 20 meters going left to right!” It’s the catch cry of the seasoned bonefish guide. Our 10 days together came to a close all too soon and we left Ben to get on with the job of establishing his operation. We will return in 14 months time. Based in New Caledonia, SPC is an international organisation that works in public health, geoscience, agriculture, forestry, water resources, disaster management, fisheries, education, statistics, transport, energy, human rights, gender, youth and culture to help Pacific Island people achieve sustainable development. Think of them as the United Nations of the Pacific. Joining our team was Etienne Picquel of Blue Calédonie Fishing. Gear anglers will be familiar with Etienne — an impressive character and master of stand-up tackle for pelagics both large and small. Etienne is responsible for some of the most impressive catches in the South Pacific, and he’s an expert skipper and rigging magician. The association with Michel and Etienne began in Aitutaki in 2009, where we met during the Bonefish project on Aitutaki in the Cook Islands, and the prelude to the filming of “Itu’s Bones.” SPC were instrumental in supporting the Cooks project and the scenario we now found ourselves in is surprisingly similar. The negative effects of climate change and sea level rise aside, the Pacific Islands face a set of circumstances that will be familiar to many. Commercial investment has generally bought improvements in infrastructure, trade and commerce. However, large offshore commercial fishing operations have also contributed to the decline of the fish stocks that have historically been part of the local diet and a revenue earner for local fishermen. While tourism sees increased visitor numbers, these operations tend to be offshore owned employing low-paid, largely unskilled labor, and mostly women. These days, larger resorts and hotel operations tend to derive as much income in-house as possible. Food, drinks, entertainment, tours and even the goodies in the gift shop with it’s “Made in China” local souvenirs have little if any “flow on” effect for local people. All up, life is changing very rapidly in the Pacific, and if you are a young man looking for meaningful employment the situation is increasingly challenging. SPC’s core focus is really all about improving the lot for peoples of the Pacific. The development of recreational sports fisheries is a small subset of their work, but it delivers surprisingly large returns for relatively low inputs. 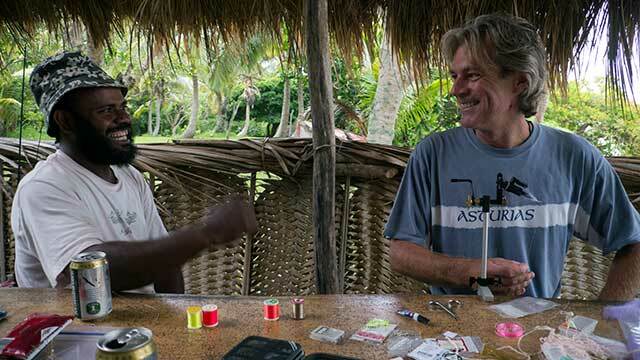 Fly anglers play a unique and vital part in the economies of these islands. Let’s face it, by necessity, traveling fly anglers are a pretty thrifty bunch. After shelling out for an international air flight there’s seldom little left over to book yourself into swanky upmarket digs for a week or so. But my recommendation to get the most out of any trip is to soak in the the culture and soul of the Pacific, give the big white-washed corporate hotels a miss, and mix it up with the locals. For most tourist destinations around the globe the “visitor profile” of the vagabond fly angler is generally regarded as low value and not pursued. However, this is pretty much the profile that suits smaller owner-operator businesses perfectly. Fly anglers tend to stay in cheaper mom-and-pop accommodations, buy local produce grown and prepared by local people, and buy locally produced souvenirs. And the guides they come to fish with often rely on their other local businesses – everything from the cousin doing the outboard repairs to the aunty that bakes the local bread. And of course, if you run the local bar or bottle-shop you’re probably doing all right too. In short, fly anglers tend to do a great job of supporting local businesses, putting dollars directly into local economies. An important fact to keep in mind when heading into the Pacific is that it doesn’t take much to make a great difference. Anglers that begrudge using a local guide, even for just a day or two, not only miss out on the best fishing opportunities, but also divert vital income from the very operators that make these fisheries possible in the first place. After helping set up Ben back in 2012, our crew was back again, this time ably assisted by our fly fishing camera man Earl Kingi. With 50 fully guided days under his belt Ben is doing well and has taken possession of his new boat, an extremely sturdy alloy craft of 6 meters. It is of Cook Islands design, common to the region, with a long front bow and deep V to make easy work of transporting anglers around the lagoon. It features a substantial casting platform up front. Having spent a fair amount of time bouncing around in small boats, I’m pleasantly surprised at how softly she rides. On this trip we made some long sorties out into the lagoon and twice were caught out by rough weather returning home, and Ben’s boat was the most seaworthy I’ve had the pleasure to be aboard in rough weather. The Poingam area in New Caledonia is at the very northern tip of Grande Terre and requires a 5-hour road trip from the airport. I’d suggest considering breaking the trip for an overnighter about half way and taking time out to have a crack at jungle perch and black bass that inhabit some of the local rivers. This is our second stay at Relais de Poingam. 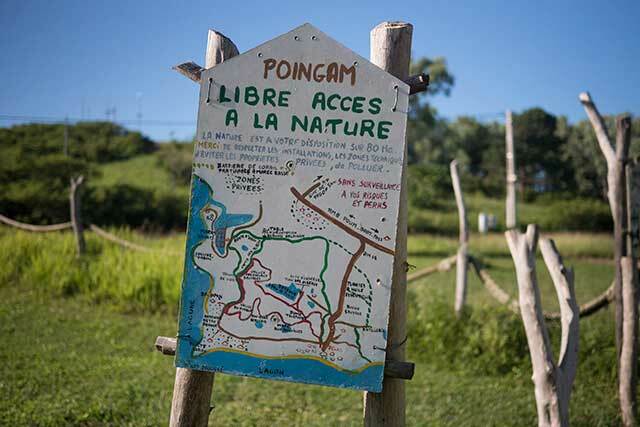 “Resort from Poingam” is operated by New Caledonians Jean and Josy Broudissou and they are terrific hosts. The resort offers a relaxing French/South Seas flavour with 6 spacious bungalows set in beautiful garden surrounds. Exactly what you’d hope to find in an exotic Pacific location. For those on a budget, the couple also operates a camping ground adjacent to the restaurant. 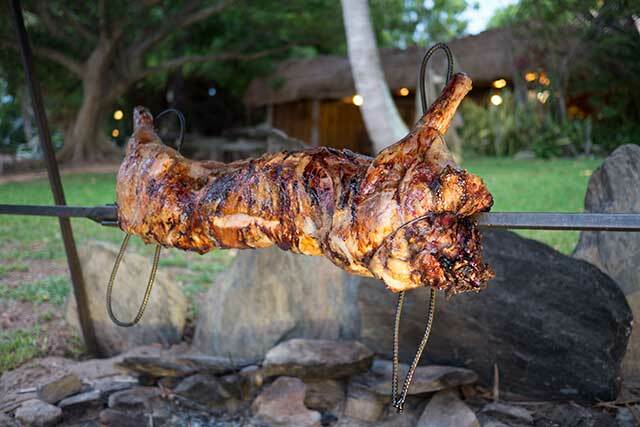 The food is nothing short of remarkable with a sumptuous three-course French meal prepared every night, accompanied by plenty of good French wine and local produce. Packed lunches are the best I’ve experienced: they are generous, tasty and comprehensive. Cost varies, but for around US$180 per night you can expect comfortable accommodation, fabulous meals, including the impressive packed lunch, a bottle of wine over dinner, and the obligatory chilled Sangria apéritif to kick things off. Very affordable. Relais de Poingam sits right on the lagoon, with your guide virtually picking you up at the doorstep each morning. Then it’s just a short boat ride to the well known flats of Boat Pass and Baaba. 15 000 km2 of the lagoon are listed as a world heritage site (UNESCO) since 7 July 2008, and the Poingam area is part of it. These lagoons are of exceptional natural beauty. They feature a huge diversity of coral and fish species and a continuum of habitats from mangroves to seagrass, with the world’s most diverse concentration of reef structures. With protection, management and sustainable development, New Caledonia promises huge potential for some of the greatest recreational sports fisheries anywhere on the planet. New Cal’ is not a destination for anglers new to bonefishing, but if it’s quality rather than quantity that rings your bell then Poingam should be on your bucket list. Bones in double figures are common and although I’ve not been on the business end of one yet, fish that are clearly well into, and above the 20lb mark have been spotted on each trip. The lagoons of New Caledonia display prime intact ecosystems, with healthy populations of large predators, and a great number and diversity of big fish. Monster GT’s, huge coral trout, red bass, yellowfin and dogtooth tuna are all there to be chased. This vast area has barely been explored with fly. The man to contact is Etienne Picquel of Blue Calédonie Fishing via his website at www.bluecaledoniefishing.com. Etienne will organise everything from where to go, your guide, accommodation, transfers, the lot. It’s Etienne that will greet you at the airport and take you up to the resort. At present the only way to book guiding days with Ben is via Etienne as Ben has no website and very limited English. Over time we’ll see more of the vast Pacific open up to recreational angling, the area is huge and there is much to explore. The Northern New Caledonia fishery is still developing, but the raw ingredients for a fantastic recreational fishery certainly seem to be all lined up. Based on experience with the protects in Aitutaki and New Caledonia, it seems clear the development of recreational sports fisheries afford broad-ranging benefits. Given time and with sufficient promotion the financial flow-on affect can be substantial, the environmental benefits many, and the social impact large. These types of projects fit well within island communities and hold the promise of many more profitable, long-term and sustainable businesses for the people of the Pacific. Most sportfishing locations in the Pacific are remote and isolated, so you’ll want to take extra care in your preparation. Bonefish generally feed on an incoming tide on benthic worms, fry, crustaceans, and mollusks. Like trout, bonefish are fairly opportunistic feeders. While specific prey items inhabiting the flats of the world may vary, it’s fair to say that the ubiquitous tan Crazy Charlie or Gotcha should be your first and likely best bet. It’s the Hares Ear Nymph of the bonefishing world. And like trout fishing, varying sizes and weights of flies are more important than specific patterns. Shallow calm water calls for lightly weighted flies, in deeper broken water heavier flies are required. My preference is an 8wt, brand and action – who cares, the fish certainly don’t. I go for an intermediate sink tip almost every time. The sink tip helps get down to where I need it and doesn’t pull the fly up off the bottom as a floater does. The main floating section of line helps ride high above coral and obstacles while making a pickup much easier. Again, brand matters little. I’ll start with a tippet of around 6-7kg (15lbs) and go down a little if fish are looking shy, or up if fish are large or we’re over broken ground or coral bommies and the brakes need to be put on in a hurry. I don’t fish fluorocarbon for a multitude of reasons, but primarily because it is weak for its diameter, and knot strength on fluoro is poor compared to high quality monofilament. 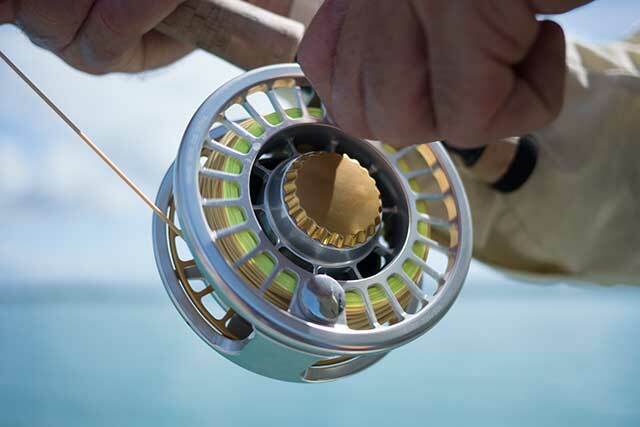 High-quality, abrasion-resistant mono allows me to fish a thinner, stronger tippet and that means more potential for hook ups and better chances of landing fish quickly for release. Despite endless discussions on the light refractive index of fluoro vs. mono, and contrary to what the marketing department would have you believe, fish, all fish, can see your tippet. We’ve filmed and photographed tippets for years now – believe me, tippet, regardless of material, is not invisible. I only use two: a guides’ version of the Slim Beauty for leader construction (I always build my own) and Lefties Loop (the non-slip mono loop) for the tippet to fly connection. Neither have failed me, ever. Stonefish are not common on Bonefish flats, but they do inhabit most of the Pacific. Coral cuts in the tropics can lead to real problems and I’ve tried all manners of wading boots, gym shoes, socks and booties during my travels. I now throw in a simple pair of Croc-like sandals – ugly as hell, but they are light, dry fast for the trip home and are easy to kick off and empty out the coral sand that inevitably gets into any footwear worn on the flats. Keep an eye out for rays, there’ll often also be bones about, but standing on one will end you up in hospital regardless of what’s on your feet. I’m always conscious of looking down to see what I’m about to tread on. The catch cry here is cover up. 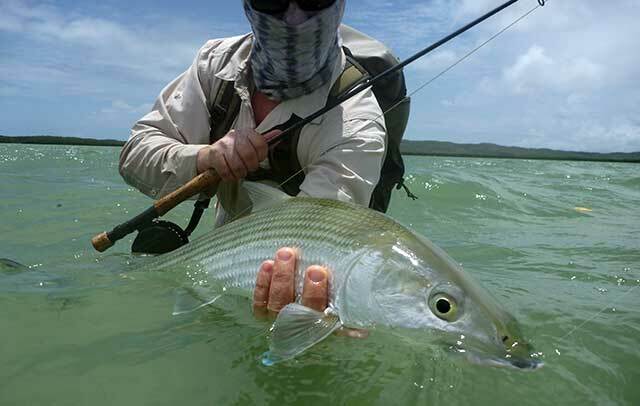 As with all bonefish locations around the world the Sun out on the flats can be relentless. But in the Southern Hemisphere the thin clear atmosphere combined with a dirty big hole in the earths ozone layer means the rays down-under are nastier than anywhere else on the planet. Exposed to direct sunlight, you can almost hear your ears sizzling like bacon on a BBQ. Also greenly a little cooler, aluminium and white decked boats are a killer for sunburn, you’ll get burnt in places you never knew existed. While regularly lathering up with sunscreen is the obvious answer, long sleeved shirts and long quick dry pants are the go – you’ll also need this same uniform in the evening when the mozzies come out, socks in the evening help prevent the inventible attacks to the ankles. 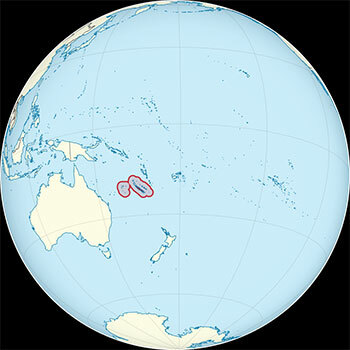 Dengue fever is present in most of the Pacific at various times of the year. Although not common, it’s something you definitely don’t want to come home with. I’ve pretty much done away with caps in the tropics, they are more of a fashion accessory than any sort of decent sun protection. A wide-brimmed hat will go a long way to prevent getting chunks cut out of your ears in the future. Drink bucket loads of it, at least twice as much as you feel like drinking. At least 5 litres of water per day I’m told. Increasingly, clean potable water is a challenge within the Pacific. Most water will be bottled (or should be) and I now travel with at least one water purification device these days. Ball cream – pack it! If you start to chafe you’re on the slippery slope to a whole lot of heart ache and pain. Don’t be tempted to sneak into the cook house and give the olive oil a try. If you can, book your trip dates to coincide with low tide in the mornings. You’ll fish the rising tide as the day progresses and light improves. My experience throughout the Pacific is as the day progresses to afternoon you are more likely to encounter winds and cloud cover. Early morning tends to be calm and clear. When both moon and sun excerpt their gravitational pull on the earth in concert, tides are most pronounced and are referred to as spring. Spring tides see a greater difference between high and low tide. With high tides tending to be higher, and low tides tending to be lower than the neap. The time difference between spring tide and neap tide is normally 7 days and is in accordance with the phases of the moon and sun. Theories differ as to what is best for bonefishing. Personally I’d go for moderate neap tides if given the chance. I think it’s easier for the fish, and is certainly easier to wade and spot. That and after a few shark scares I have an aversion to deep wading!